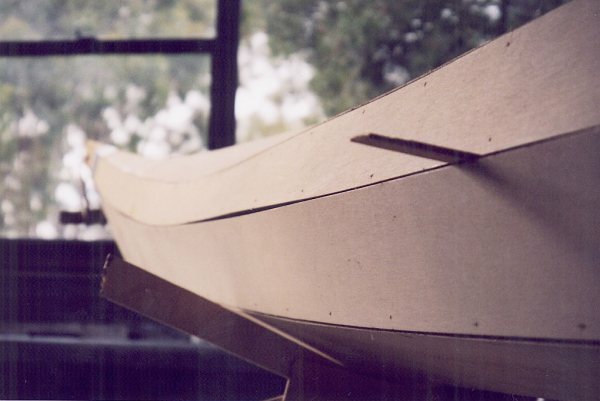 This one shows the fit with only a thin spacer between the two halves. I'm pretty pleased with the match between building top and bottom without any large variations. To make sure that the top which I built second matched the bottom I glued the seams at 6 am and then went home from work at lunch time as the final set was taking place, put both halves in the mold and spread the top to match the bottom. I then put a thick spacer in between so that I could get my fingers in to place the longer wires to continue with the stitch and glue on the middle seam. As I worked along the length I tweaked up the wires as even as I could and then reduced the spacer thickness until on removal of the last one the sides could be manipulated to match . The only area where I was about 2ply over was at the nose. 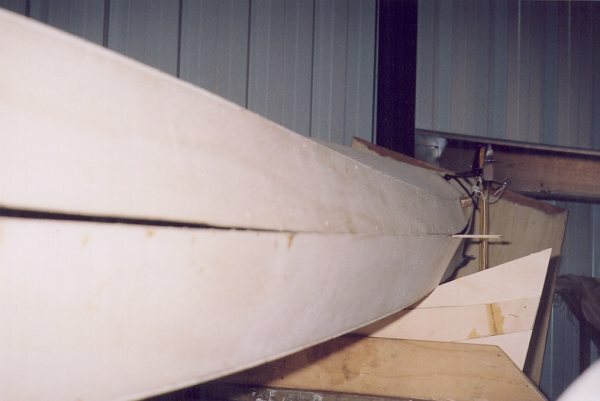 Mind you I did champfer the edge of the ply so top and bottom would sit flush rather than as sharp edges that fell off each other when tensioning the wire. Most other seams were not champfered and gave a good thick line along the seam about 2 mm thick, which when it was done even looked pretty attractive. 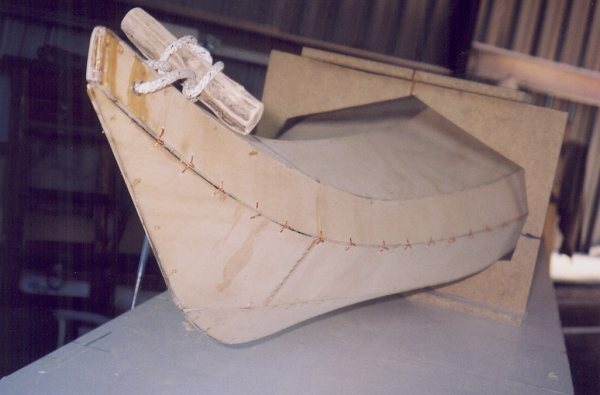 This shows how well it came together just by stitch and glue without the huge rolls of tape you had to use. glueing the joint internally I had the same "fun" you mentioned but used a large syringe on two sticks to spread the resin on the seams. 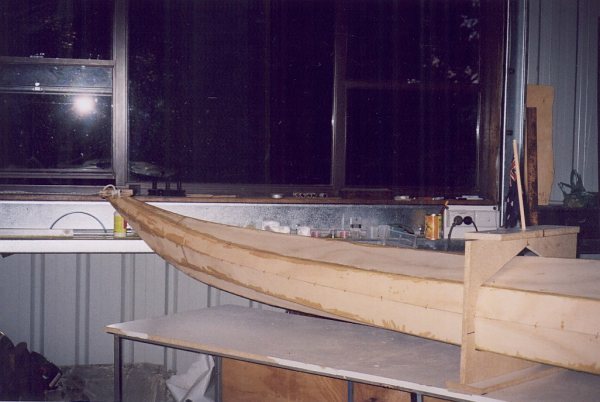 (Note my little bit of artistry, using a piece of salvaged Huon Pine branch to make the lifting handle) It compares nicely with the smooth finish when we cut and polished the hull at the last moment before launching. 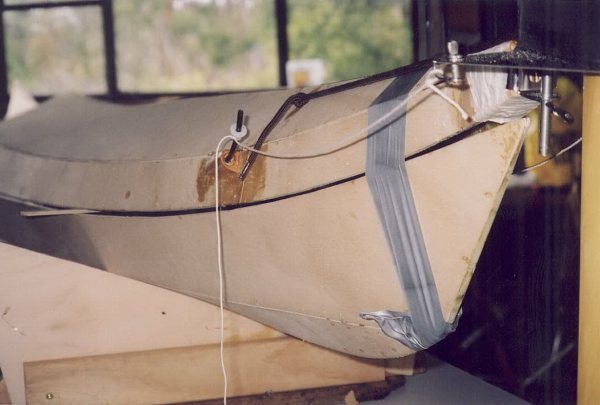 Another view of the stitched kayak. 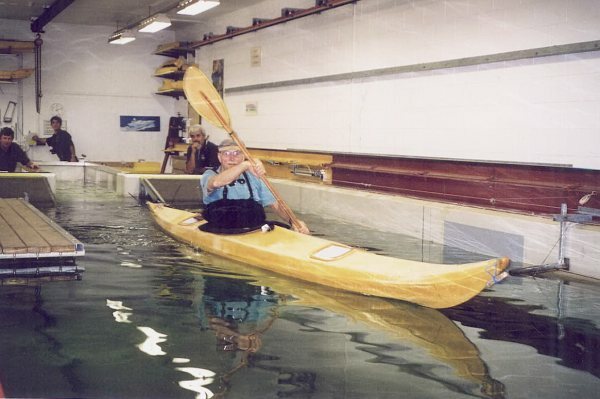 The first float in the Australian Maritime College Wave testing tank in Launceston, Tasmania, Australia. We only had a layer of resin all over at that stage, so we used their clean water to see where the balance points were for location of the seat etc. This gives you a close up on the official launch in the Trevallyn Power station Tailrace in Launceston. 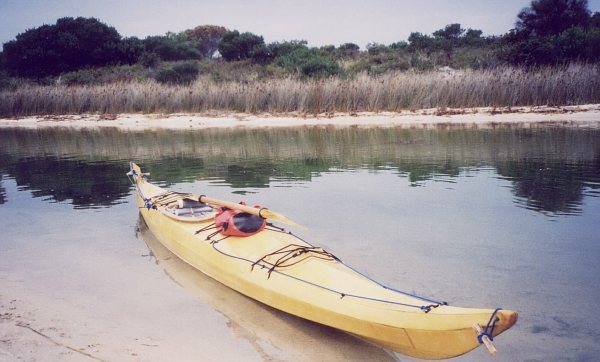 The other kayak, a Cape Charles, was my friend Rod's, who built his at the same time as me and we launched together. Be pleased because the Guillemot raised the most eyebrows, but Rods was a fine looking job as well. My other Friend Ross owns the Blue Cape Charles in the lower corner of the picture. 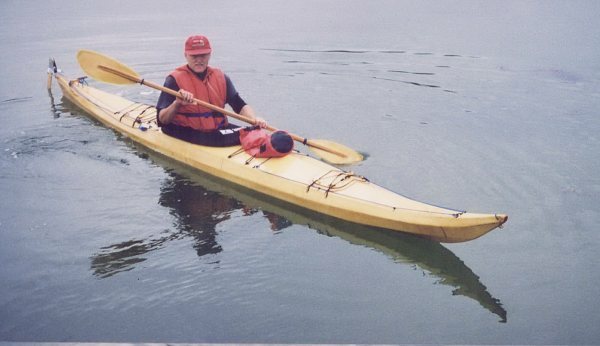 And here is the finished article with its skipper (me) in a lagoon at Binalong Bay on the East coast of Tasmania. 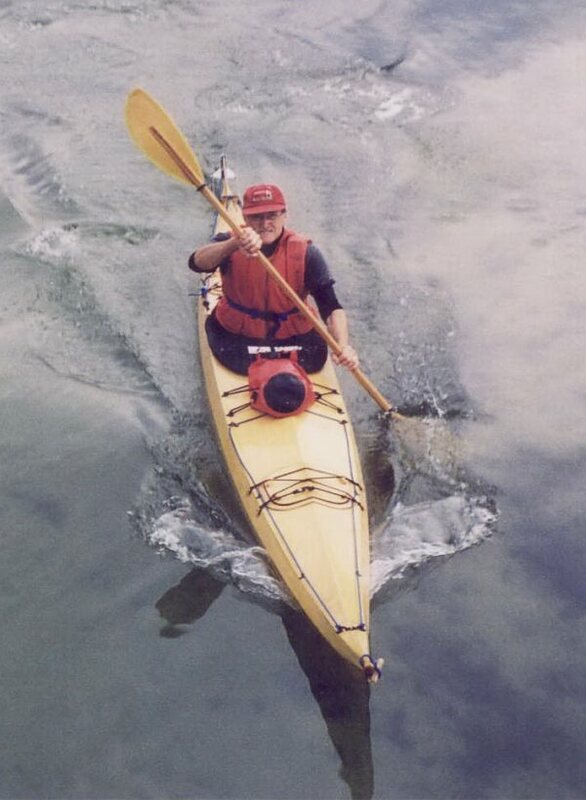 From September 16, 2003 when I ordered my ply, working through until March 3rd 2004 when we launched, I had one of the best experiences of my life and now look forward to enjoying the wilderness trips to come with the use of this beautiful craft. 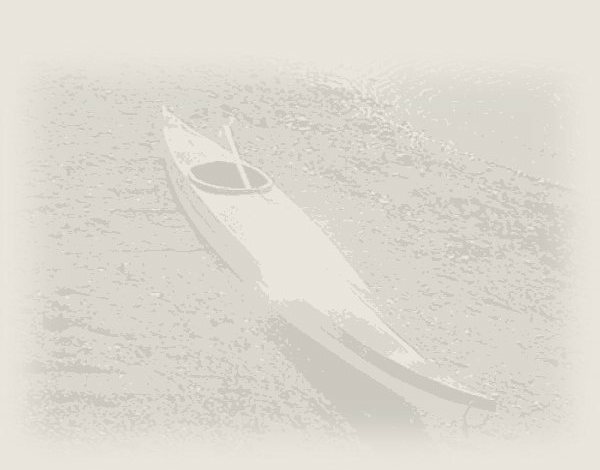 Thanks again Nick (Schade of www.guillemotkayaks.com). And thank you to you also, John, as I really enjoyed your journal and it helped a lot to convince me I could build it. Something else I forgot to mention. The final uv protection varnish was International Goldspar . Sprayed on 7 coats thick over 2 days. 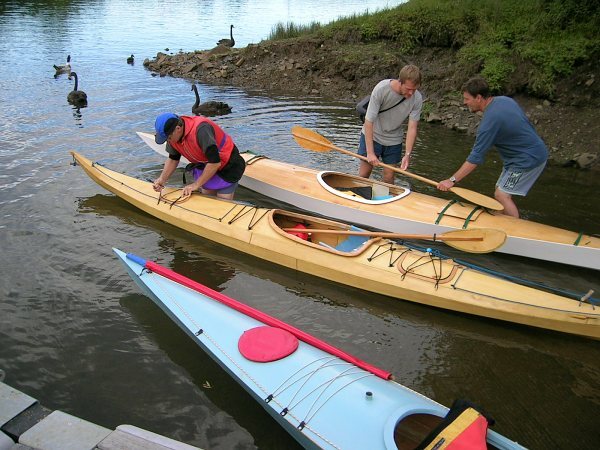 Also please try a local website and see some of the more adventurous kayaking done in Tassie.